Whether it is peewee, high school, college or professional, football remains the most popular spectator sport in the U.S. A recent Gallup poll found that 37 percent of Americans preferred watching football compared to any other sport. However, when injury occurs on the field, it can turn an exciting outing into a scary scenario. The Centers for Disease Control and Prevention estimate millions of sports- and recreation-related concussions—mild traumatic brain injuries—occur each year in the United States. It happens when a blow, a jolt to the head, or a hit to the body causes the head and brain to move rapidly. This movement causes the brain to bounce around inside the skull, which damages and stretches brain cells and creates chemical changes within the brain. Helmets are designed to lessen traumatic brain injury by absorbing the force of the impact. As manufacturers race to make helmets safer, scientists in Mississippi State University’s Bagley College of Engineering and the Mississippi Agricultural and Forestry Experiment Station have designed a better helmet, one inspired by nature, specifically ram horns. The horns of bighorn sheep are spiraled and tapered. Male bighorn sheep clash at a speed up to 12 miles per hour and a force equal to 764 pounds, yet their heads are protected. “When looking at bighorn sheep, with the high force placed upon their horns and the lack of perceived injury, we found that the tapered spiral geometry of the horn is very effective in mitigating energy from the point of impact,” said Dr. Raj Prabhu, co-inventor of the bio-inspired helmet design. The assistant professor in the Department of Agricultural and Biological Engineering said brain injuries are caused, not from the initial hit, but from the shock or stress waves in the aftermath. “These waves move back and forth through the brain tissue as they dissipate, leaving damage in their wake,” Prabhu added. 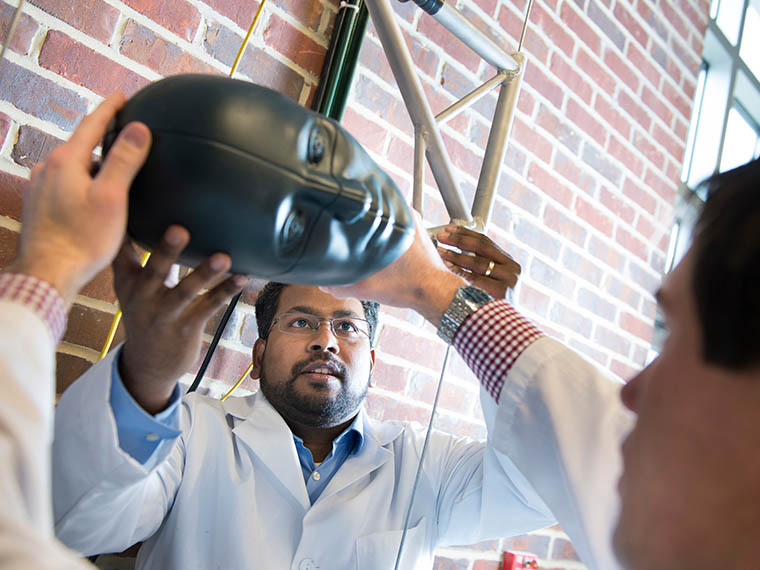 MSU scientists found that the key to building a better helmet is to disperse the stress waves. The researchers have obtained a patent based on this shock-wave mitigating principal. 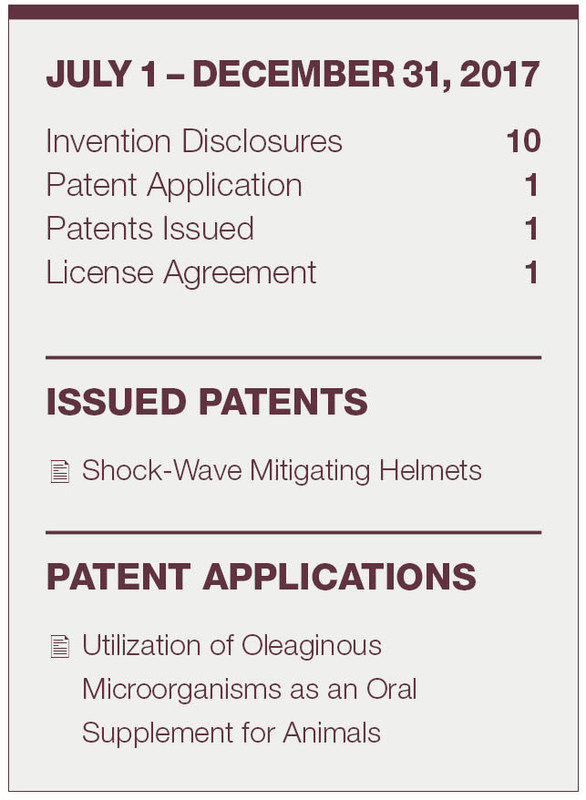 The patented-helmet contains two portions. The first portion includes three layers. The middle layer is less dense than the two other layers, serving as a shock absorber. The second portion of the helmet contains numerous energy dissipaters. Each dissipater has a rod that extends in a spiraling manner, similar to the ram’s horn, from a fixed end to a free end. The fixed end is larger and tapers down to the free end, which vibrates when the helmet is hit to dissipate the impact. The dissipaters look like tiny springs attached inside the helmet. The next step in the research is to test the helmet on a model of the human head. Using the drop tower test, Prabhu and his colleagues will test the helmet using various degrees and types of impact. The research team hopes the end result will mean less injury on the field. “If the outcome of the test is as expected—an improved helmet—then the application of this technology could be extended to protective head gear for soldiers on the battlefield, race car drivers, bicyclists, and more,” Prabhu said.